Brad Clark’s passion for art comes largely from a rich heritage of artists and patrons of the arts. 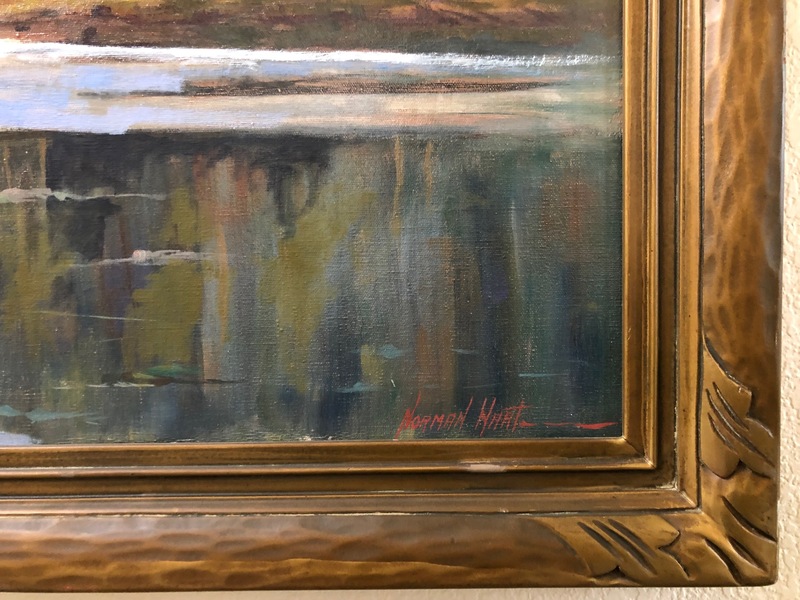 Brad’s maternal grandfather, Norman Hart, was a plein air artist and custom frame maker residing in Long Beach and Snowcrest, Mt. Baldy, California. He was a member of the Painter’s and Sculptors Club of Los Angeles. 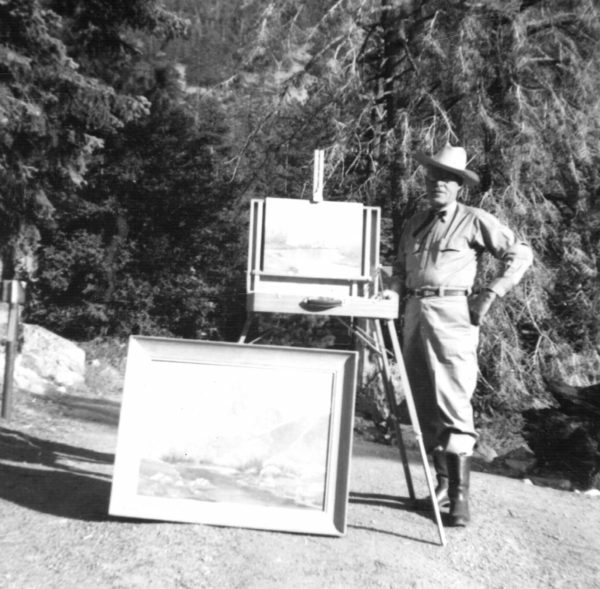 Brad’s paternal grandfather, Herald R. Clark was a patron of the arts and (among numerous other noteworthy accomplishments), was responsible for acquiring a significant collection of Maynard Dixon paintings and sketches for Brigham Young University. Norman Hart was born in Utah and was the nephew of Utah’s famous artist, John Hafen (additional information on John Hafen). Some of Mr. Hart’s earliest recollections, and doubtless his first artistic inspirations, originated from “Uncle Johnny’s” studio. 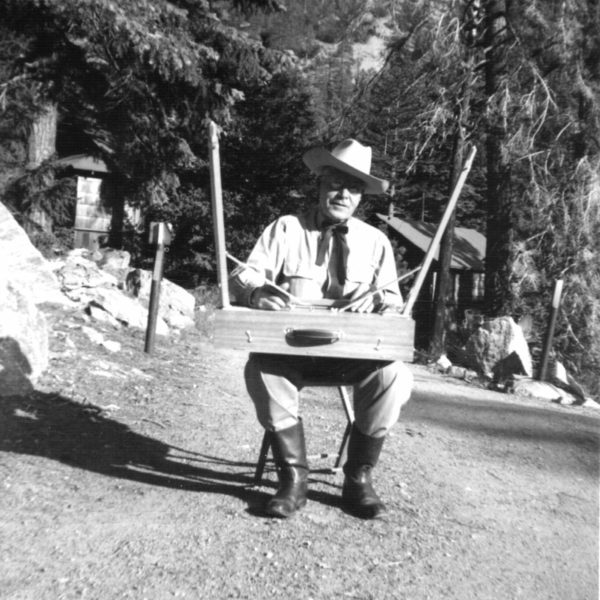 Norman Hart commenced his art studies under Professor Eastman of the B.Y.U., in Provo, Utah. 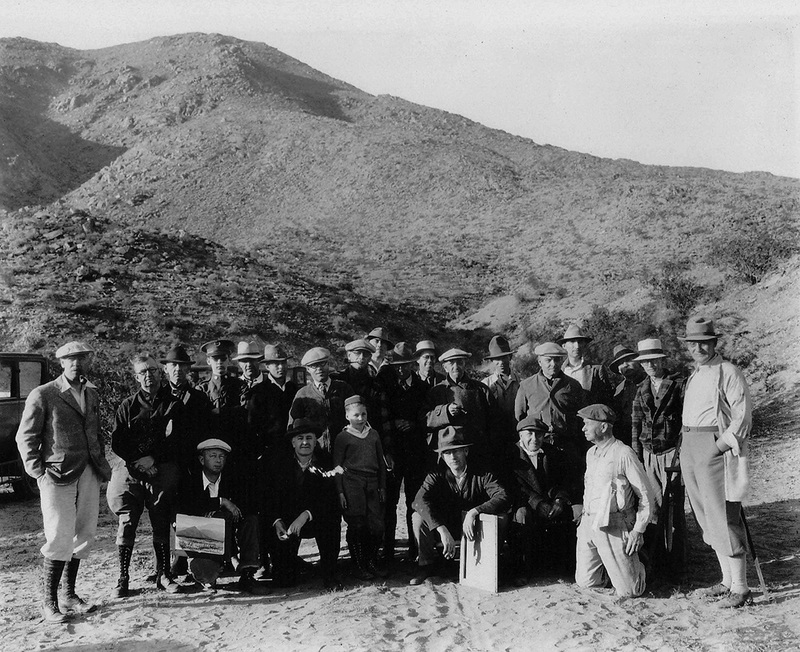 He came to California in later years and continued his studies under such able instructors as Henry L. Richter and Mildred Byant Brooks. Mr. Hart was a versatile artist whose works include etchings, watercolor, oils and life drawing. He was a member of the Spectum Club of Long Beach, the Long Beach Art Association, and the Painters and Sculptors Club of Los Angeles. Paint out in the southern California Desert. Estimate that this photo was taken around 1932 judging by the age of the young boy (my uncle Norman, my mother’s older brother). My grandfather is standing behind the boy, near the center of the group sporting a tie and glasses. 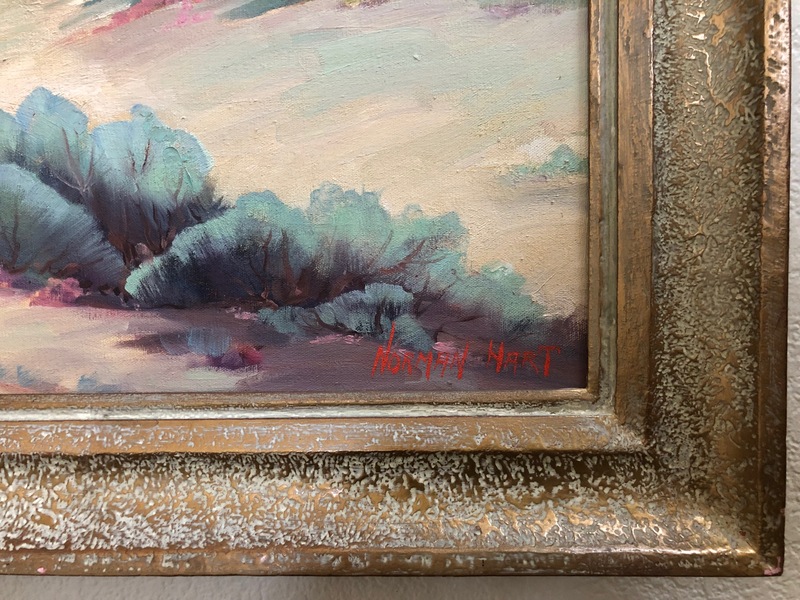 My grandfather Hart owned a custom framing shop in Long Beach, CA where he crafted hand-carved, gold-leaf frames for many of his contemporary artists in the Southern California area. 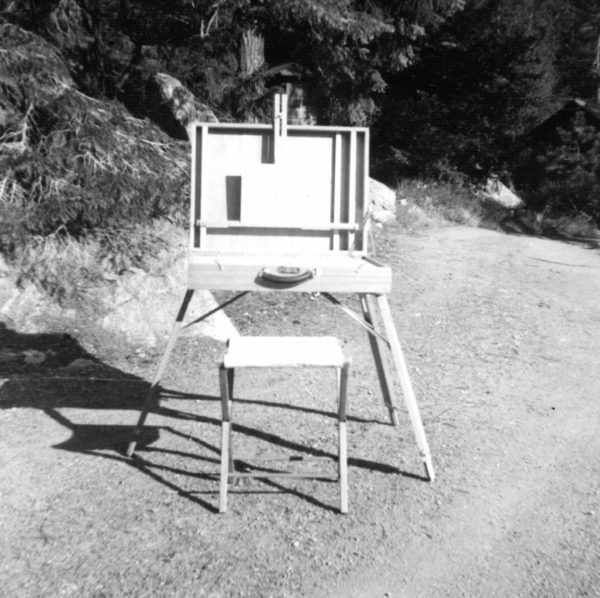 He also designed and crafted painting boxes, two of which serve as my easels today! Herald R. Clark was the Dean of the College of Commerce (Business) at Brigham Young University spanning several decades. Even though Clark came from a background in business, he had a deep love for the fine arts. He desired the students at BYU to have exposure to great artists and thinkers of the time and assisted in bringing world renowned musicians, conductors, and guest speakers to the campus. Clark directed a lyceum series for 53 years , from 1913 to 1966, during which time such luminaries as Art Buchwald, Pearl S. Buck, Robert Frost, Helen Keller, and Carl Sandburg came to speak. He was also instrumental in bringing eminent performers to BYU, among them Bela Bartok, Sergei Rachmaninoff, the Vienna Choir Boys, the Boston Symphony, and the Berlin Philharmonic. “In May 1937, in a single acquisition, Brigham Young University took possession of 85 paintings and drawings by Maynard Dixon. Dr. Herald R. Clark, who was at the time dean of the College of Commerce, arranged the purchase with family funds. Given the national recognition that Dixon has received over the intervening 60-plus years, one can’t help but admire the adventurous and sensitive nature of this one act. 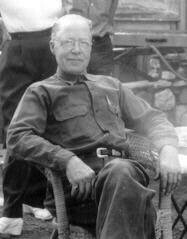 Picture it: a man whose discipline is economics, working in a university whose primary objective at the time was the education of teachers, not only being attracted to the ground-breaking work of a contemporary artist but also negotiating a major acquisition for the University – all within the context of the Great Depression. His action and its effect are most remarkable. Until the time of the transaction, there had been no institutional commitment to acquiring art at Brigham Young University. A few works of art had been given to BYU, but no one had ever purchased a group of works for the University, let alone on the scale of this purchase, which focused upon one significant artist. Clearly, Dr. Clark’s foresight was inspired. It would be interesting to know if the arrival of the Maynard Dixon paintings caused some controversy. Was the value and purpose of the collection to the campus community debated? Did this acquisition suddenly bring the university into the role of institutional collector? Regardless of the formal conclusions to these questions, or even if the questions were asked at all, BYU was suddenly given an enormous responsibility. The school immediately became the site of a “collection”. 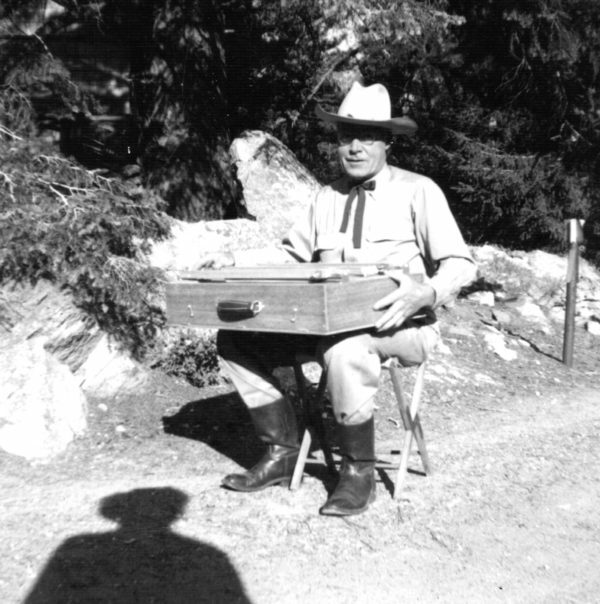 I speculate whether the Mohonri Young estate of over ten thousand works of art would ever have come to Brigham Young University in the 1950’s had Dr. Clark not pushed the university into its new role. I am also convinced that there would not be a BYU Museum of Art had these gifts not been made. 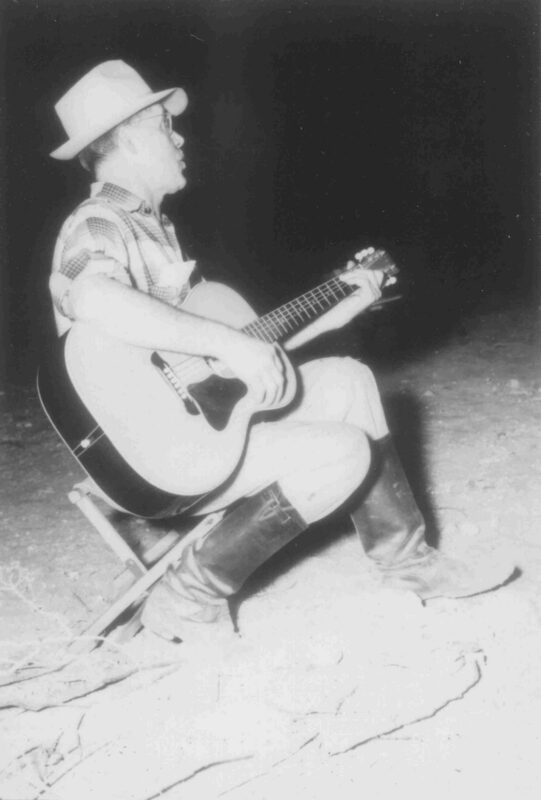 Clark’s original purchase contained a remarkable sampling of Dixon’s career. The university has since acquired additional works. 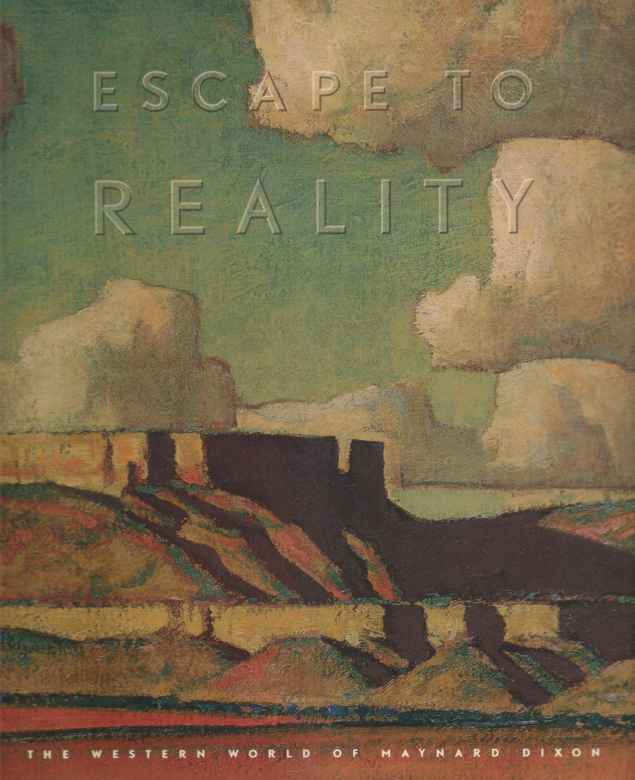 Now, with the loan of 22 significant paintings, the exhibition Escape to Reality: The Western World of Maynard Dixon and this, its accompanying publication, add significant new scholarship by placing Dixon’s work within a broad historical context. 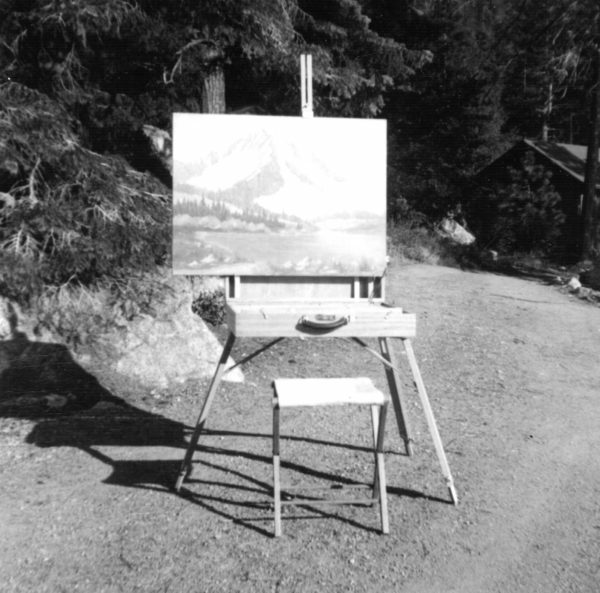 “Dixon’s periodic visits and residency in Utah near the end of his life do not, however, account for the presence at Brigham Young University of this most significant collection of his art. 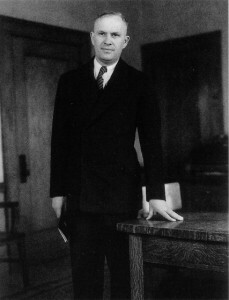 The acquisition was largely due to the efforts and foresight of Herald R. Clark (1890-1966), dean of the College of Commerce (later the College of Business) at BYU from 1934 to 1951. Clark was personally responsible for the transaction of May 28, 1937, that procured most of the more than one hundred Dixon paintings and drawings currently in the museum collection. Even though Clark came from a background in business, he had a deep love for the fine arts. He desired the students at BYU to have exposure to great artists and thinkers of the time and assisted in bringing world renowned musicians, conductors, and guest speakers to the campus. Clark directed a lyceum series for 53 years , from 1913 to 1966, during which time such luminaries as Art Buchwald, Pearl S. Buck, Robert Frost, Helen Keller, and Carl Sandburg came to speak. He was also instrumental in bringing eminent performers to BYU, among them Bela Bartok, Sergei Rachmaninoff, the Vienna Choir Boys, the Boston Symphony, and the Berlin Philharmonic. Clark’s efforts to secure the Dixon art collection for BYU was thus not an isolated effort to enhance the cultural environment of the University. 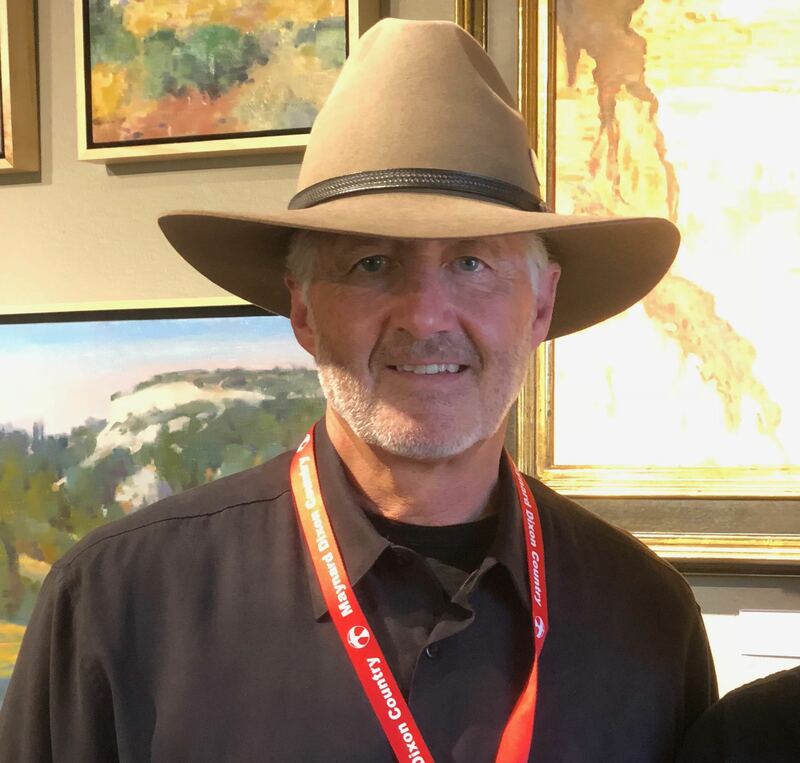 It is not known exactly when Clark first became familiar with Dixon’s work, but he may have seen the California painter’s art on exhibit in Utah. 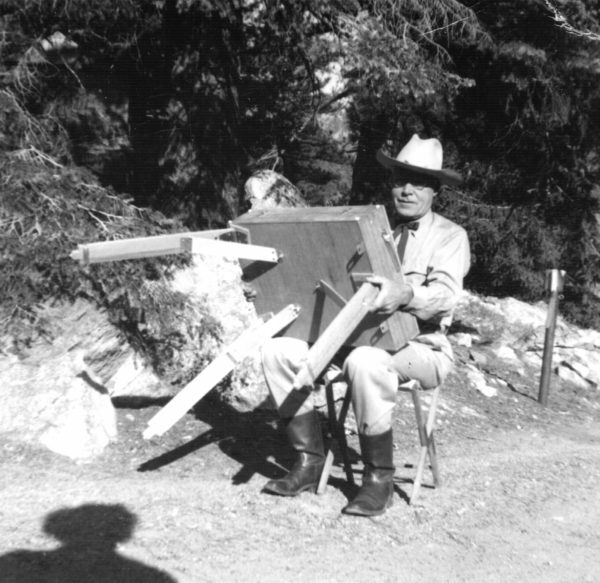 In the winter of 1933, 17 Dixon paintings were shown at a gallery in Salt Lake City. In 1916, the year prior to the acquisition, his work was exhibited in the Art Barn in Ogden, at West High School in Salt Lake City, and at the annual Salon at the Springville Museum of Art. 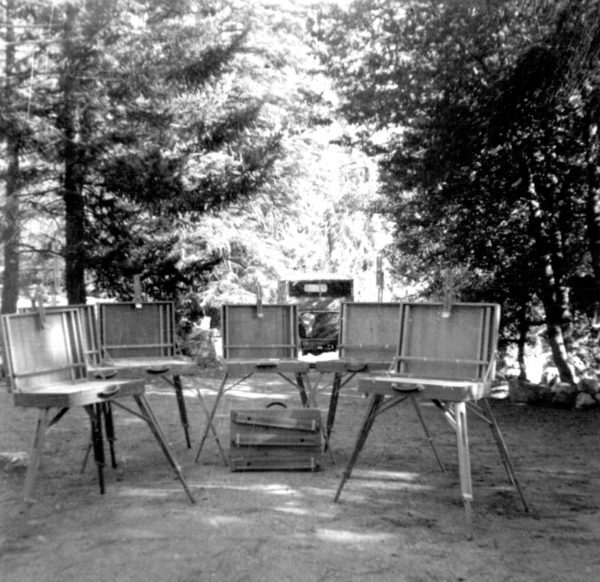 What we do know is that in the spring of 1937 Clark traveled to San Francisco to meet with Dixon and discuss the possibility of acquiring some paintings for the University. He apparently arrived at Dixon’s studio unannounced only to find no one there. Clark soon located him on Montgomery Street, where he made a proposal to purchase a substantial collection of Dixon’s art for BYU. A purchase agreement was quickly reached that entailed 85 paintings and drawings for a sum of $3,700. One might assume that Dixon’s works were sought for the BYU collection because of the predominance of western themes and depictions of Utah scenery. It is true that the body of works at BYU contain such striking Utah subjects as High in the Morning, a dramatic close-up view of the Great White Throne, one of the landmarks near the entrance to Zion National Park. Other Utah paintings include Mormon Farms (1933) and the later work Mormon Home. But the collection is quite representative of his entire career and include illustrations , drawings, and paintings done in Montana, California, Mexico, Nevada, Arizona, and New Mexico. According to the Clark family, it was actually Dixon’s depictions of the maritime strike in San Francisco and scenes of the Great Depression that first drew the economist’s serious attention. Clark’s trip to San Francisco to meet with Dixon and negotiate a purchase came just two months after he saw an article in the St. Louis Post-Dispatch of March 28, 1937. 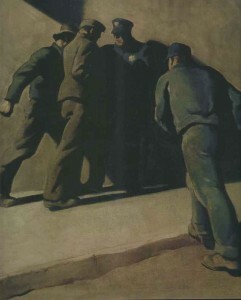 The column, entitled “The Modern Industrial Scene: Four Paintings from the Labor Front by Maynard Dixon, American Artist,” contained illustrations of Keep Moving (1934 PLATE 101), Free Speech (1934-36 PLATE 104), No Place to Go (1935, PLATE 107), and Pickets (1934, PLATE 108). 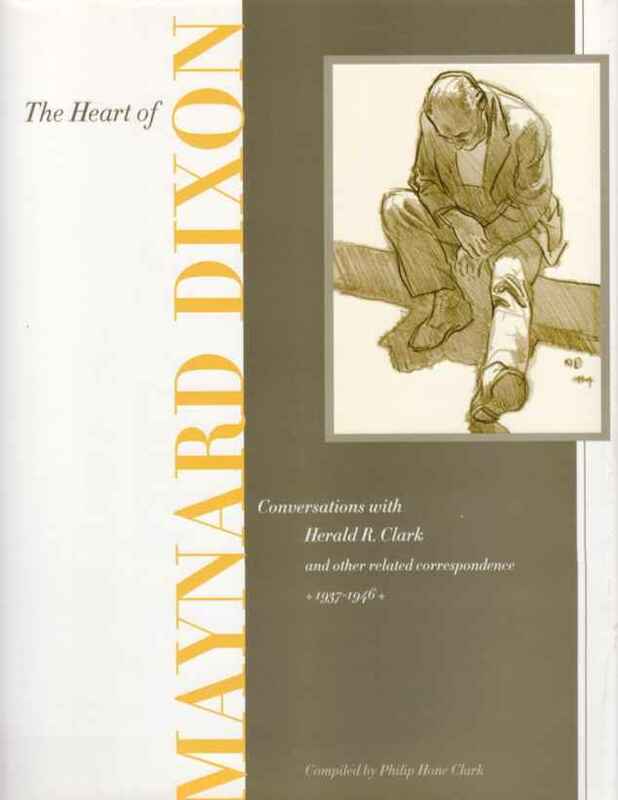 There is undoubtedly a connection between the fact that Herald R. Clark went to California to meet with Dixon at the end of the Great Depression and that his selection of paintings for the university included Dixon’s maritime strike paintings and the “Forgotten Man” series. This latter group depicts the unemployed during the depression, characterized by the unforgettable image that bears the name of the series, a dejected man sitting on a curb (1934, PLATE 106). The very paintings Clark had seen in the St. Louis Post-Dispatch were now coming to the university. The original title for Destination Unknown (1938, PLATE 97), one of the works from the “Forgotten Man” series, was “But for the Grace of God There Go I”. Having personally lost considerable assets in the stock market crash of 1929, Clark may have felt that “but for the grace of God there go I” close to home. It seems that he not only had a eye for quality and a social conscience but also related to the poignancy of the images on a personal level. I seems that this is Brigham’s birthday – the old boy must be sore at me for something because I had no sooner gotten started…to re-write this agreement when one of my 350 watt lights blew up with a loud report spraying the whole studio with blue glass…It’s not clear just why he should rebuke me but I have no doubt his stalwart spook would be capable of creating an explosion. Herald R. Clark and Dixon stayed in touch after the acquisition took place. Dixon had committed to Clark that he would visit BYU and speak to B. F. Larsen’s students after his move to Mt. Carmel in October of 1940. On October 20 he wrote to Larsen: “According to my promise to Clark I should now be in Provo talking to your classes. Well, the sad story is that after returning here my health go so bad that I had to go back L.A. for treatment.” In early November, he wrote again. “Am still looking forward to speaking words of wisdom to your class–though this depends just now on our building program, the weather, & my wheezy lungs.” There is no evidence that this visit to campus ever took place. 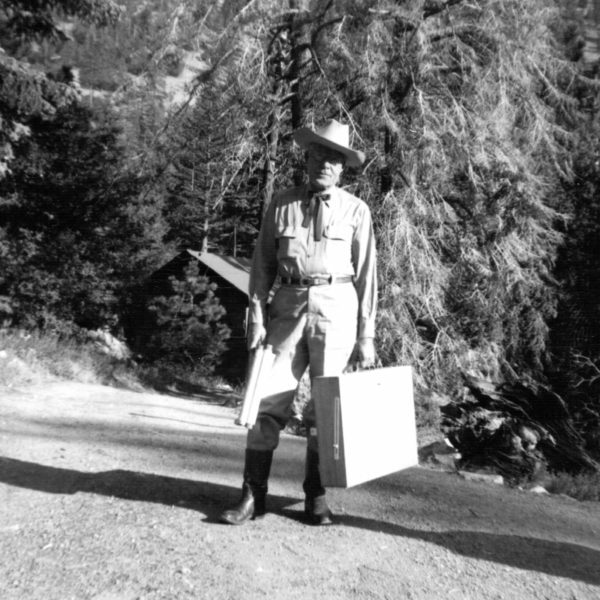 He apparently came to BYU only once, in 1937 to the summer school in Provo Canyon at Aspen Grove, where 22 of his recently purchased works were on exhibit. The Heart of Maynard Dixon memorializes a large volume of communications between Maynard Dixon and Herald R. Clark, extending from 1937 through 1945. The documents were discovered by Philip Hone Clark, in the personal files of his father. These letters reveal intimate personal insights into Maynard Dixon. Click on the link above to open the Memory Book. This is a large pdf file and will take several minutes to download depending on the download speed of your network. 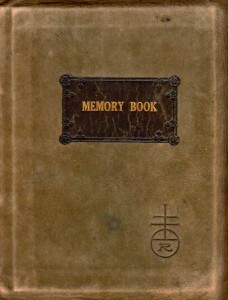 The Memory Book contains signatures and personal notes to Herald R. Clark from musicians, authors, philosophers and performers who participated in the BYU Lyceum program directed by Dean Clark.